We’ve allowed people to drink coffee during our worship services for quite some time now. Yes, it creates a relaxed atmosphere, but I’ve questioned its long-term effectiveness. The more I think about it, the more I realize that coffee itself isn’t special. It’s what happens in the process of serving and drinking that has the potential of changing lives. How do you serve and love one another? All too often we let these texts speak to us in a reactive way. When something negative happens, we put on our loving and serving hats and try to make the situation positive. But… what if we wanted to create a positive culture to begin with? What if loving and serving actually described our Church community? What if Christians engaged in authentic love and concern with fellow Christians? 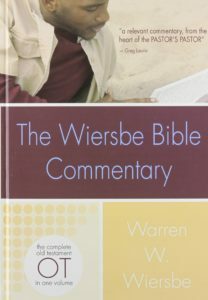 Want people to talk? Give them a coffee or a tea and a place to connect. 1. Serving coffee provides social connection. Our culture demands food when we connect together. If you want to have an effective social event, there better be lots of food and coffee. Likewise, if you show up to an event and refreshments are served, your social cues encourage people to connect. 2. Serving coffee inspires relationship. A conversation, with a tea or coffee in hand, usually leads further than a conversation without. You may think that’s an overstatement, and it probably is for those who like to talk. For those who are a little socially awkward, however, having something to drink can break the ice and fill-in empty space. 3. Serving coffee invites participation. Our coffee cart is a “self-serve” one. One of our goals is for people to engage others in service. Everyone has the ability to make a donation for their coffee, perhaps donate for someone else’s coffee, or simply offer to make a coffee for a newcomer. Participation is an active ingredient in servant-hood. 4. Serving coffee allows for common ground. It doesn’t matter what store-bought coffee you buy or drink, or even if you don’t buy coffee at a café at all, everyone is on common ground when we serve coffee. Everyone is drinking from the same generic cup. With that said, technology (ie. Keurig) allows us to offer a little bit of everything to help satisfy the cravings. 5. Serving coffee demands a seating area. 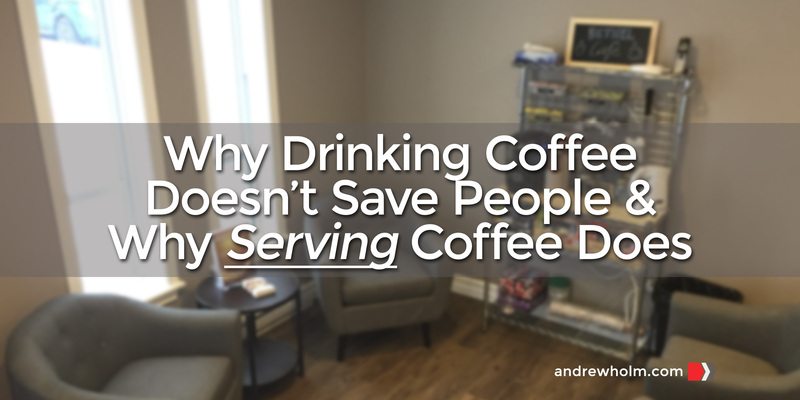 You can drink coffee just about anywhere, but as soon as you serve coffee to someone, people need a place to sit down. If people sit down, they start talking, connecting and listening and the Church becomes that much closer to an authentic community. To help facilitate, we allow people give a donation. There’s no pressure to drop some money in the jar, but we encourage those who can buy their coffee, to buy into this ministry of community. How have you helped people connect? Has coffee worked for you? 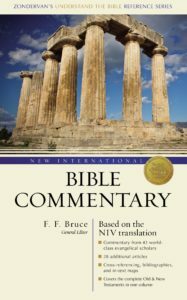 Does something else work in your context? What would you like your local church to do to encourage people to connect? I knew. I just knew, when I received the call from my dermatologist office just a few short days after having a biopsy done on a spot on my back, I knew that is was cancer. I wasn’t supposed to hear back for a few weeks, but they called to have me come in to see the dermatologist right away. I knew exactly what he was going to say. Sure enough, he explained that I had a sizeable melanoma and that surgery would be required to remove it. He would refer me right away to a plastic surgeon and they would do everything they could as fast as possible. I thanked him and went on my merry way; not really getting a sense of the seriousness of my situation. I told my wife when I picked her up from work that it was cancer and that a plastic surgeon was going to just cut it off. To give you some perspective, I am very naïve when it comes to health matters. I told her that it wasn’t a big deal and I wanted to stay positive. Within a month, I met with the plastic surgeon and the date had been set to have my surgery. He explained that he would remove the melanoma along with taking my lymph nodes in two different areas. They would test the lymph nodes to determine if the cancer had spread to those areas. I remember asking him, “How serious is this anyway?” He looked at me and said, “This is as serious as it gets for me.” He said that I was his top priority and the surgery would be done in 3 or 4 weeks. The surgery came and went and I was now the new owner of 3 scars. I still, at this point, had no real concept of how serious this was. I then met with the surgeon and he gave me the great news that the lymph nodes came back negative. He said that I was very lucky as the melanoma I had was very deep but they were successful in removing it. “Thank you God,” I reacted! The next few months we very difficult for me. Physically, I was spared from any pain as a result of my cancer. Mentally, however, it was a painful process. What do I do with my life? Do I continue to save for retirement? Will I see my children graduate? I had many questions! As I gave God more of me, His plan for my life began to reveal itself. #faith #Melanoma Click To TweetAs I went through this journey I gained perspective and I began to let God into more of my life. As I gave God more of me, His plan for my life began to reveal itself and I began to listen instead of trying to figure things out on my own. I had been running from God’s plan for many years but even though I was running away, He was still preparing me for His plan. You see, having cancer gave me the opportunity to get closer to God. He had to do something dramatic so that I would fall to my knees and surrender to Him. God called me to full-time ministry with Operation Christmas Child. I am thankful for His grace, patience and His hand of protection over me. I am now closer to Him than I have ever been in my life and I have a strong desire to know Him better every day. I now have the privilege to lead an amazing group of Christians spreading the Gospel to millions of children through the simple act of packing a shoebox. I can think of no greater joy than this! I can honestly say that I am grateful to God for the cancer scare. 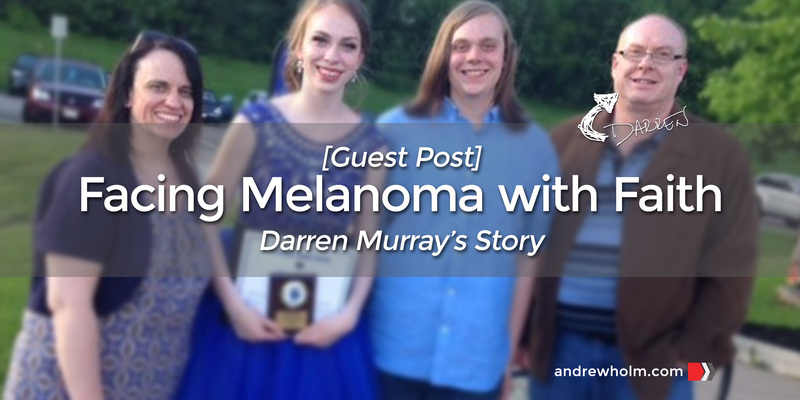 If you’ve been inspired by Darren’s story, please share this post so others can be inspired today! If you, or someone you know, has an encouraging story or testimony of how God has helped you in your journey, I’d love to help you share it! Please send your story to andrewholm@gmail.com, and we’ll post them throughout the year! Blessings! 1. ⇑ “Survival Rates for Melanoma Skin Cancer, by stage,” Cancer.org, http://www.cancer.org/cancer/skincancer-melanoma/detailedguide/melanoma-skin-cancer-survival-rates-by-stage, accessed January 10, 2017. Thank you for making 2016 the best year yet at The Journey Holm. Together, the blog exceeded all goals and received 12,000+ page views by 8,000+ visitors across 70+ countries! Thank you for sharing, liking and commenting throughout the year! I can’t wait to see what 2017 will bring! #10 – Trump or Clinton? #4 – Should Christians Participate in Halloween? What will the next ten years look like? I know age is only a number, but I’m not satisfied for my 30s to simply be a duplicate of my 20s. 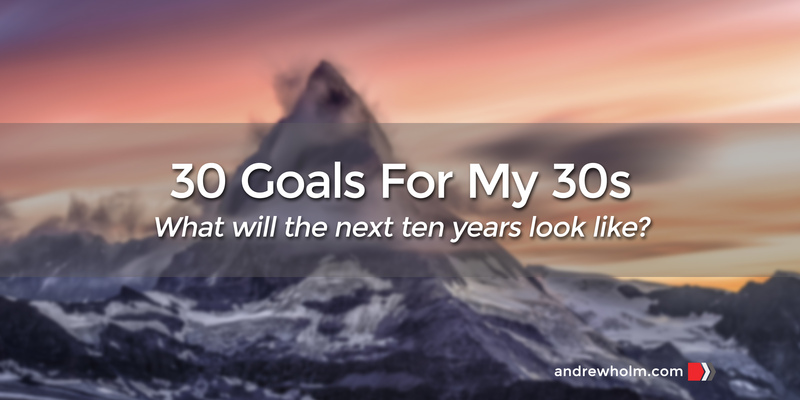 In an effort to grow, I’ve put together some goals for my next decade. Some of these are more general aspirations, but you’ll get the idea. As a family, define, establish and live by our family mission and values. Get up earlier to start my day earlier. Consistently arrive home before supper-hour. Delegate my general roles; protect my unique roles. Schedule and protect personal hobby time. Make exercise and physical activity a priority. Schedule and protect time with my kids. Love their mother (Deidre, my wife) so they learn what to expect from a relationship. Build value in them so they learn self-respect. Teach them that God loves them no matter what! Teach them that ministry is our response to God’s love, and not God’s love itself. Make the first day of school as special as possible (Sept 2019; Sept 2021). Love Deidre during this transition (ie. Make sure she has a tea from Tim Hortons). Make it a habit to pick them up from school. Find a need and volunteer at their school. Continue to tell Deidre how much I love her every day. Plan something incredible for our 10 year wedding anniversary (July 2019). Pay final student loan payment (2020). Become a home owner (2025). Continue to take healthy risks. Don’t let every opportunity take the best out of me. Become better at learning, remembering and using people’s names. Be faithful with the ministry I’m called to lead. Annually increase engagement with my blog (The Journey Holm). Stay in line with SCRIPTURE – These goals are important to me, but if I leave what I believe and value the most behind, my success in these 30 will be in vain. Ensure ACCOUNTABILITY – I always ask God’s Spirit to keep me in line and I’ve made my list public (that helps), but I also need honest people in my life (wife, friends, mentors…) to hold me accountable so that the next ten years are actually a success. Let’s face it, the Spirit prompts us, but often has to use someone else to nudge us. So now that I’ve been pretty open and transparent, it’s your turn to challenge yourself! What do you hope to accomplish in the next stage of your life? How and when will you make it happen? Learn from the past; focus on growth for the future. So I’ve turned 30. For some reason after you leave your 20s, you can no longer hide behind being “twenty-something.” People might take you more seriously, but they also expect more. 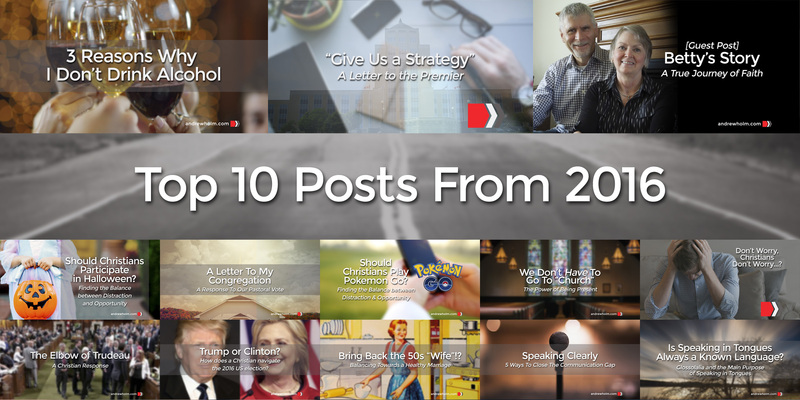 As I reflect on what I’ve accomplished (or not), worked through and experienced over the past 10 years, I figured I’d let you in on a few lessons I’ve learned. My prayer is that these lessons help inspire all of us to grow on the journey God is calling you to pursue. If you’re in your 20s, maybe the lessons are helpful. If you’re older and wiser, maybe it’ll help you reflect on your last 10 years as well. God prepares, I’m along for the ride. I earned a Business degree from MUN (2008) before moving into theology. I thought I was running from God’s call to ministry, but it turns out God was preparing me. It was one of the best educational decisions I could have made. Marriage is the best commitment I’ve ever made. July 11, 2009 will always be the beginning of my biggest and most exciting adventure! Going to Bible College as a married couple took off all the pressure. While everyone was trying to find the love of their life, we were on the crazy journey of working, learning and exploring Toronto. I wouldn’t give up the experience for anything! School is expensive and loans aren’t free. I’m still paying for every good and bad decision I made as a student. Have fun, but think twice before spending money. Commuting is draining. After commuting in Toronto for over a year, I will avoid commuting in the future at all costs! Sometimes we convince ourselves that we have to make a certain amount of money, but the cost of distance is very draining on a marriage. Don’t shy away from big opportunities. At 25 years old, I took on the role of Lead Pastor of a small church (Bethel Bay Roberts). I didn’t think I was ready, and I probably wasn’t. But God doesn’t always call the equipped, he can also equip those who are called (Hebrews 13:21). Taking healthy risks is never a bad thing. Risk can sometimes lead to failure, but risks always lead to learning something new. One thing I can say for sure – innovative success always beginnings with a healthy risk. You’re never ready for kids. I will never have enough energy, time or money. No matter what, we had to adjust what we had in order to “train up a child in the way they should go” (Proverbs 22:6). Raising kids is exhausting, but extremely exciting. I wonder where my toddler’s energy comes from, because I don’t have it. We might celebrate an “early bedtime” kind of night, but waking up to a child who calls me “daddy” is the beginning of a good day. My wife has to come before my kids. I love my kids and they are my pride and joy, but my wife and I are a life-long team. She’s my “partner in crime” and I can’t afford for my kids, or anything else, to derail that. Dedication and commitment always pay off in the long term. I’ve blogged on and off for the past five years. Once I committed myself to posting at least one new post a week, engagement increased over 200 percent. Every aspect of my life is connected. My health, work, and home life all affect each other. It’s all too common to focus on one thing as we try to improve. I’m not exactly great at keeping the balance, but I’m learning I can’t work on one and not the other. #Learn from the past; focus on #growth for the future. #discipleship #tenyears Click To TweetAnd now it’s time for decade #3! Thanks for reading and make sure to reflect yourself! Learn from the past; focus on growth for the future. What have you learned in the past 10 years? 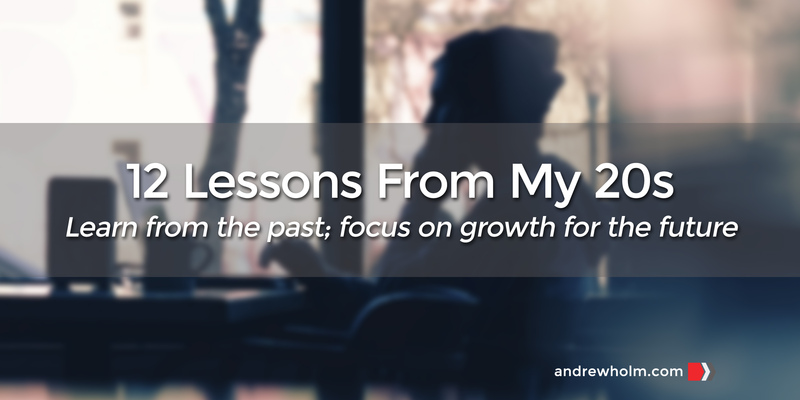 How can you leverage those lessons to increase personal growth for the years to come?